I was recently in Nashville, landing a great hotel rate because of the unfortunate flooding incident. When I wasn’t listening to radio ads for floor tiles sales and construction bargains, I visited the Chihuly glass exhibit at the Cheekwood Gardens. If you have a chance to go, I’d highly recommend it. Dale Chihuly is a renowned American glass artist, who has a permanent exhibit here in Indianapolis at the Children’s Museum, which is the only reason I knew how to pronounce his name. The Cheekwood exhibit is part of a bigger Chihuly in Nashville celebration where his work is also displayed at the Frist Center downtown. Cheekwood is a 55-acre botanical garden and art museum which would have been pretty enough all on its own. When I visited, the glass sculptures had been installed all over the estate. 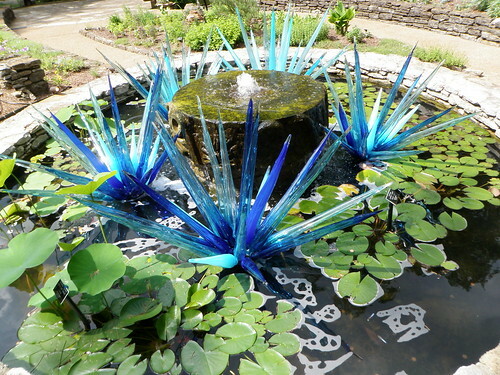 Chihuly’s work is strongly influenced by nature, so you could almost believe Nashville happened to have glass flowers and plants flourishing in its soil. One thing that puzzles me—how do they MOVE these things? I’m stressing out just thinking about moving a few dozen boxes of crap. I have no idea how they transport a 30-foot tall glass sculpture across states, or hang a huge chandelier without breaking it on a banister. Maybe they fill the shipping containers with lots of feathers? Or Styrofoam peanuts? The exhibit will be running until October 31, 2010. Admission is $15 for adults. More information can be found here. A Flickr slideshow of my walk through the grounds is embedded below. Earlier: Going to Wordcamp! Have fun at BlogHer without me! Have you been to the Chihuly display at the Children’s Museum in Indy? It’s my favorite part! Awesome! I’ve just moved to Huntsville (a scan hour or two from Nashville) and I was wondering what we were going to do this weekend while our realtor was out of town. Thanks for the head up! Sweet! That does look cool. I have seen a few of his pieces over the years. I would love to take my Mom there. And thank you for explaining the James Patterson phenomenon. I had no idea how he was keeping up that pace. It just made no sense to me. Thanks for the ‘culcha’ update. Years ago when we visited our grandmother in Nashville, we would go to Cheekwood Gardens as a treat. Thanks for bringing back the memories. The comparison to Patterson isn’t really apt. ANY large-scale glasswork is a team product. It’s not as if other artists doing pieces the size of Chihuly’s components are working alone in their studios– they ALL work with assistants whom they direct. All of them. Chihuly is one step further removed, but the expectations of personal touch and solo work are very, very different in hot glass compared to in writing. best glassblowers in the world: http://www.youtube.com/watch?v=rghU1CLMCZ4 . Lino’s the old guy in the video. Count the number of assistants who handle the blowpipe or put tools to the glass. That piece will have Lino’s name on it. Thanks for the links, Lisa. I didn’t realize glass blowing was a team sport. I guess the director analogy is a better one since it takes hundreds of people to make a movie, but the director is the one to stamp his/her name on it. That looks so freaking cool. I never made it out there and now I’m sad. What happens if it hails? Wow that was really cool. Thank you so much for sharing your tour with us. I feel like I need to help pay for admission. I would surely make an effort to see one of these lovely tours if there was one in an area I was visiting. Your pictures are great, btw. I guess you got a camera you are happy with now. Yes! I really like the director analogy. Thanks! I’m going to Nashville this weekend and was looking for something cool to do!! I went to the Chihuly exhibit at the Botanical Gardens in St. Louis. I loved it. Sounds a lot like what you saw! I was in Atlanta a few years ago at their botanical gardens and they were in the process of putting together a Chihuly display. The stuff I saw came in pieces so I don’t think they have to transport large pieces. It was the first time I had seen it and I loved it. A couple of years later I was on Oklahoma City and there was a huge display at the Museum of Art there including a very tall, stunning piece in the lobby. I think his stuff is just breathtaking. I’m a huge fan of Chihuly. A few years back, we went to an exhibit at a small museum in Huntington, (Long Island), New York. My 3-year-old, Caroline, was incredibly well behaved and loved the show. My Mom, on the other hand, who was a volunteer at the museum, couldn’t resist touching one of the pieces. It started rocking, and she nearly had a heart attack thinking it was going to fall and break. As a Nashvillian, glad you visited and were able to check out Cheekwood! :) Chihuly is phenomenol. He was the artist in residence for a time while I was in grad school and he is SUCH a neat guy – really friendly and interesting. Cheekwood is also doing Chihuly Nights where the sculptures are lit up at night – really beautiful. thanks for sharing the Chihuly! It was like a little vacation for my brain.Gorgeous! We have a great big Chihuly in the Milwaukee Art Museum. Love it. Rats! Missed it when I had the rare chance to be in Nashville. Oh, well. Next time. BTW, I’m with Natalie–what happens when it hails? We had some pretty good-sized hailstones this past winter/spring across the country. In any case, Chihuly does awe-inspiring, fantastic work. Thank you, PQ, for sharing. re hail– What happens to your house/apartment windows, or your car windows when it hails? How about your patio table? Nothing, usually. All the pieces Chihuly’s displaying have been blown specifically to be outdoors– they’re thicker glass than, say, an expensive wineglass. They’re pretty sturdy. And depending on the specifics of how a piece is displayed/installed, a chip may or may not even show. And even if one component of a piece becomes unusable, in general IMO the components can be rearranged to work anyway. Long story short, this stuff is blown to be pretty hail-resistant. One of my friends volunteers at Cheekwood, and she told me about getting ready for the Chihuly exhibit. She said that the staff are given pretty much free rein in choosing how to display the pieces, which I thought was awesome–the pieces move from garden to garden (and city to city), but it’s never the same exhibit. For a long time I thought a chihuly was some sort of exotic shell, because that is what it looked like in the episodes of Frasier where it is usually being dusted by Daphne. I felt so stupid when I finally realised how famous the name was and how beautiful the pieces were. Huge Chihuly fan here, too. We have a few permanent pieces of his in the Milwaukee Art Museum — when the new wing opened, his was the first exhibition. It was wonderful. Thanks so much for the pictures. I want to see his exhibit on the bridge in Tacoma.